An affordable 3 pack of LED headlights. 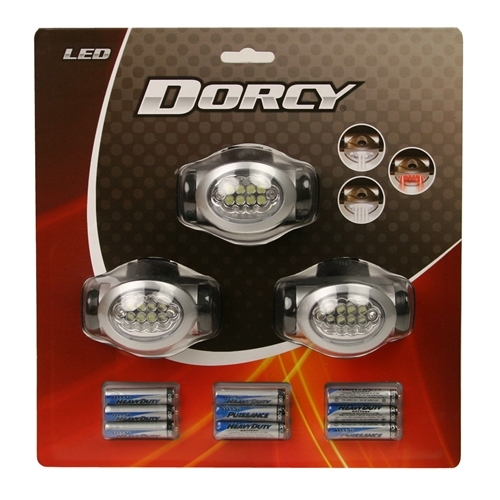 Dorcy's 41-3095 is a 3 pack of 10 LED headlights. Each light features 30 lumens of output, 8 super bright white LED lights, and 2 red blinking LED lights. On high, 8 white LEDs shine for maximum power. On low, only 4 LEDs turn on. This results in less light output and a longer run time. On the third setting, the two red LEDs flash. This is a great option for safety. The headlights are also comfortable to wear and have an impressive 8 hour run time on 3 AAA batteries. 3 AAA batteries are included for each light.